Hasenpfeffer is a trick-taking game, based on Euchre, for four players in partnerships. Hasenpfeffer adds a bidding system to determine who gets to choose the trump suit. It also adds a joker as the most powerful trump in the game. However, if you hold the joker, and nobody else bids, you have to, whether you want to or not! Despite the German name, Hasenpfeffer isn’t from Germany, but instead most likely originates from the Pennsylvania Dutch, much like Euchre itself. While there is a rabbit stew called hasenpfeffer, the name more likely derives from the German idiom “Hase im Pfeffer“, which roughly translates to “in a pickle”. This is particularly appropriate, considering that the player dealt the joker may well find themselves in a pickle because of it! The object of Hasenpfeffer is to be the first partnership to score ten or more points. Points are scored by taking tricks and by fulfilling contracts made by bidding. Hasenpfeffer uses a unique 25-card pack. 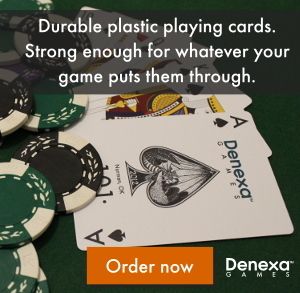 Fortunately, such a deck is easy to construct from a pack of Denexa 100% Plastic Playing Cards. Just add one joker and take out all the 2s through the 8s. You’ll be left with a deck with aces through 9s only in each of the four suits, plus the joker, of course. The players need to be divided into two partnerships, with partners sitting across from one another. The turn of play will alternate between partnerships when going clockwise. You can decide the partnerships by whatever method you agree on—random card draw or just mutual agreement both work. Shuffle and deal six cards to each player. Place the odd, 25th card face down in the center of the table, forming the widow. The bidding begins with the player to the dealer’s left. This player may either pass or bid any number of tricks, from one to six, that they think their partnership can take if they get the right to choose the trump suit. The next player to the left, if they wish to bid, must make a higher bid than the preceding player; they may also pass. This continues until all four players have had a chance to bid. The dealer gets the final bid; the bidding does not continue for a second round. Should all four players pass, the player holding the joker reveals it to the other players. This player is obligated to make a bid of three tricks, which automatically becomes the high bid for the hand. If the joker is the widow card (meaning nobody holds it), the hand is void, and a new hand is dealt by the next dealer. The side which won the bidding becomes the declarers, and their opponents become the defenders. The high bidder takes the widow card into their hand, declares the trump suit for the hand, then discards one card, face down. The high bid becomes the declarers’ contract for that hand. The high bidder leads to the first trick. Each player to the left, in turn, then plays a card. If a player is able to follow suit, they must. Otherwise, they are free to play any card they wish, including a trump. The highest card of the suit led wins the trick, unless a trump is present, in which case the highest trump wins the trick. When a player wins a trick, they do not add it to the hand. Rather, captured tricks are kept in a shared discard pile in front of one of the partners. Since scoring depends on the number of tricks captured, each trick should be placed onto the pile at right angles, so that the tricks can be easily separated after the hand. Whichever player wins a trick leads to the next one. After all six tricks have been played, the hand is scored. If the declarers managed to capture a number of tricks equal to or greater than stipulated by their contract, they score one point per trick collected. If they do not, they lose points equal to the contract. For example, a partnership has a contract of four. If they take five tricks, they score five points. If they take three, they score –4. Regardless of whether the declarers make their contract or not, the defenders always score one point for each trick they take. Game play continues until one partnership reaches a score of ten or better. That team is the winner. If both partnerships reach a score of ten on the same hand, the declarers for that hand win the game. This makes it impossible to win a game while defending, unless the declarers fail to make their contract. Buck Euchre (also known as Dirty Clubs) is somewhat of a cross between Euchre and Rams. It’s a trick-taking game for four players. Unlike regular Euchre, however, it’s every player for themselves; there’s no partnerships! Like Rams and other games in its family, Buck Euchre penalizes players for failing to collect at least one trick. If a player is not confident in their ability to take a trick, they can, in most cases, simply drop out of the hand. Recognizing that your hand is total garbage and dropping out of the game to avoid a penalty. Buck Euchre uses the same stripped deck that regular Euchre does. Starting from a deck of Denexa 100% Plastic Playing Cards, remove all of the 8s through 2s. You’ll be left with a 32-card deck composed of ace to 9 in each of the four suits. You’ll also need some way of keeping score. Pencil and paper works all right, but you can use any method that suits your fancy. Each player starts the game with 25 points. Shuffle and deal five cards to each player. (You may deal this as a batch of three to each player, followed by a batch of two, if desired.) Turn the top card of the stub face up and place it on top of the stub. The suit of this card, the upcard, is the proposed trump suit. Cards rank in a different order in the trump suit then they do in the other suits. The highest trump is the right bower, the jack of trump. The next highest trump is the left bower, the jack of the same color as trump. This is followed by the ace, king, queen, 10, and 9 of trump. If the upcard is a club, clubs automatically become trump. Otherwise, the trump suit is determined by the bidding round, as described below. Note that if clubs become trump automatically, since the bidding round is bypassed, every player is obliged to play the hand. The player who fixes the trump suit is called the declarer. The declarer is obligated to take at least three of the five tricks in the following hand. The player to the left of the dealer has the first opportunity to accept or reject the upcard’s suit as trump. If they accept, they do so by stating “I order it up.” If a player orders up, the dealer takes the upcard into their hand and discards any other card face down onto the stub. When a player declines to order up, the opportunity passes to the left. If the first three players pass, the dealer may accept the upcard’s suit as trump by drawing it and discarding, as before. Otherwise, they turn the upcard face down. If the dealer rejects the upcard’s suit as trump, the player to the left of the dealer has the first opportunity to name another suit as trump. They may also pass, if they wish. If all four players decline to name a trump suit, then the hand is played with no trump. If a trump suit has been decided, either by accepting the turned-up trump or by selecting one of the other three suits as trump, the other players then have the opportunity to drop out of the hand, going clockwise from the player to the declarer’s left. Any player who remains in the hand must take at least one trick. Failure to do so will subject the player to a penalty. The player to the dealer’s left leads to the first trick. Proceeding clockwise from the lead player, every player contributes one card to the trick, until all four players have played. Players must follow suit, if able; otherwise, they may play any card. (Note that the left bower is considered part of the trump suit. Playing it to a trick led by a card of its “natural” suit is not considered following suit.) The player who played the highest trump, or the highest card of the suit led if no trumps were played, wins the trick. When a player wins a trick, they take the cards from it and place them face-down in a won-tricks pile in front of them. To keep it clear how many tricks the player has taken, it’s a good idea to put each trick at right angles to the one before it. After a player wins a trick, they lead to the next one. Game play continues in this manner until all five tricks have been played. If any player collects all five tricks, the game ends, with that player winning. Any player who dropped out of the hand scores nothing, positive or negative. The declarer scores a penalty of five points if they failed to collect three or more tricks. They are said to have been euchred or set back. Any non-declarer that stayed in the hand scores a penalty of five points if they failed to collect at least one trick. Any player that doesn’t meet one of the conditions above loses one point for each trick they took. The deal passes to the left, and another hand is played. Further hands are played until a player’s score reaches zero or less. That player is the winner. If two players reach zero or less on the same hand, the player that is further in the negative wins the game. If the players have the same score, they tie. 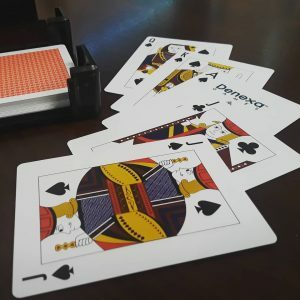 Pepper is a trick-taking game similar to Euchre, played in Ohio and Iowa. Though it’s quite a bit simpler and easier to learn than Euchre, it still provides ample opportunity for the use of cunning strategy. Pepper is best as a four-player partnership game, though variants for two and three players exist. The object of Pepper is to accurately predict the number of tricks that you will capture in a hand if allowed to select the trump suit, or to stop your opponents from capturing the number of tricks they need. Pepper is played with a stripped 24-card deck. 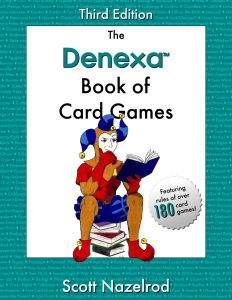 Starting from a deck of Denexa 100% Plastic Playing Cards, remove all the 2s through 8s, leaving you with 9s through aces (six cards) in each of the four suits. You will also need something to keep score with. Pencil and paper works well. Shuffle and deal six cards to each player. Pepper uses an unusual ranking of cards, although it will be familiar to those who have played Euchre or Five Hundred. In non-trump suits, cards rank in the conventional order, i.e., from highest to lowest: A, K, Q, J, 10, 9. In the trump suit, however, the cards rank differently. The jack of the trump suit is called the right bower, and the jack of the same color of the trump suit is called the left bower. (For example, if the trump suit were diamonds, the J♦ would be the right bower and the J♥ would be the left bower.) Both are considered part of the trump suit, ranking above all other cards in that suit. The complete rank of cards in the trump suit, then, is right bower (J), left bower, K, Q, 10, 9. Each hand begins with the bid, where the players compete for the right to choose the trump suit. The available bids are the numbers one through five, signifying an intent for their partnership to collect one to five tricks respectively, and bids of little pepper and big pepper, which are both bids to collect all six tricks. A bid of big pepper, which is higher than little pepper, essentially doubles the potential risk or reward to the partnership. Bidding starts with the player to the left of the dealer, who may make any of the bids described above, or pass. Each bid must be higher than the bids preceding it. Bidding continues until there are three consecutive passes. The high bid becomes the contract for that player’s partnership. The high bidder’s partnership becomes the declarers, and the opposing side the defenders. The high bidder may name any of the four suits as trump, or declare there will be no trump for that hand. The high bidder leads to the first trick. Players must follow suit if able; if not, they may play any card, including a trump. The trick is won by the highest card of the suit led, unless a trump was played to that trick, in which case the highest trump takes the trick. Captured tricks are not added to the hand. Instead, all of the tricks a partnership takes are kept in a combined pile in front of one of the partners. To speed scoring at the end of the hand, it’s a good idea to keep the tricks separate somehow, like by turning each trick at right angles to the previous one before putting it on the pile. After all six tricks have been played, the hand is scored. If the declarers made their contract (i.e. they captured the number of tricks bid or more), they score one point for each trick taken by the partnership. If they failed to make the contract, they lose six points, regardless of the amount of the contract. If the high bid was big pepper, the partnership scores twelve points for taking all six tricks and loses twelve if they did not. The defenders score one point for each trick taken. Game play continues until one partnership scores 30 points or more. Whichever partnership has the higher score at that point is the winner. If the score is tied, the game ends as a draw. Pepper can also be played with two or three players without partnerships. In both cases, three eight-card hands are dealt; in the two-handed variant, one of these is discarded unused. Bids in this version go up to seven, with the pepper bids representing an intent to take all eight tricks. Failure to make a contract results in the loss of eight points. A successful big pepper bid scores sixteen points, while an unsuccessful one sets the player back sixteen points.